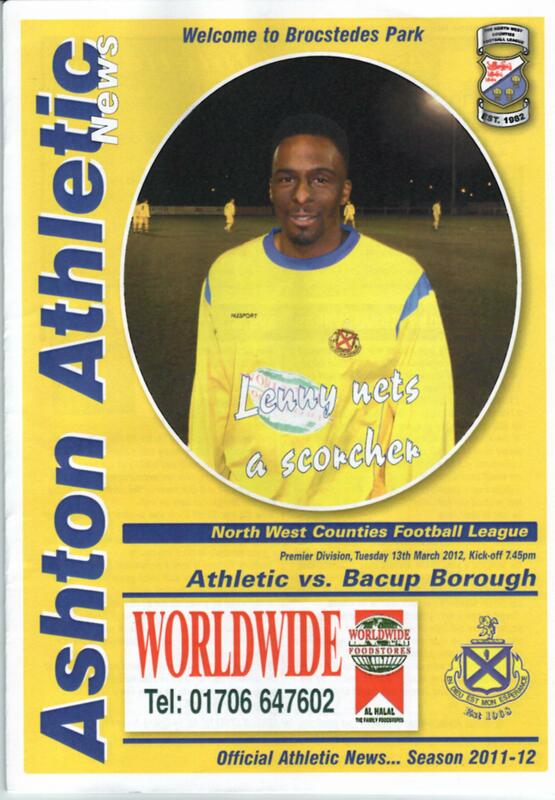 Ashton Athetic were born in 1968 and have only had recent experience at North West Counties level. They were promoted up to the Premier division in 2007-08 after entering the league the year before. 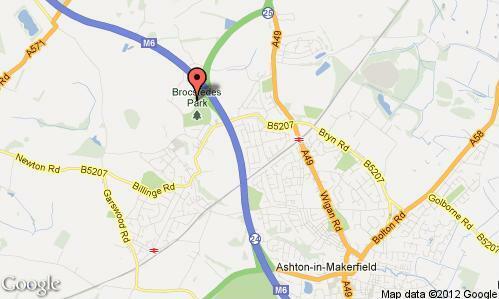 Their ground, Brocstedes Park, is very handily situated next to the M6, junction 25. It’s literally 1 or 2 minutes away. 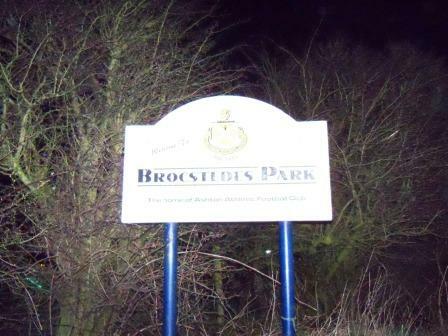 Although it is a very circuitous route to the ground, involving an orbit round the bigger Brocstedes Municipal Park before deploying the heat shields and decelerating into the rare atmosphere of Ashton’s football ground. I wouldn’t like to do it on foot. The sign on the left is still a fair distance from the ground. For those of you familiar with the Horrid Henry series of books and TV programmes, Henry’s local football team is called Ashton Athletic – whether this is just a nomenclaturial coincidence or Francesca Syme is a massive fan of the Ash I don’t know. The Ashes, as they’re also known by, are one of a pair of teams from Ashton-in-Makerfield near Wigan – the other being Town. 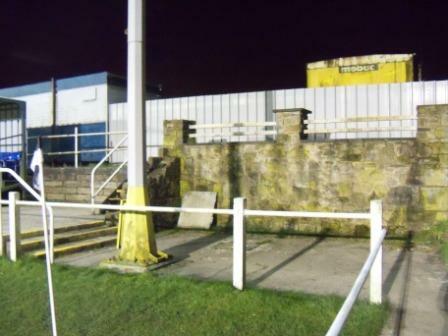 Another Ashton double exists on the other side of Manchester – Curzon Ashton and Ashton United, from Ashton-under-Lyne. It’s quite a dark desolate ground, with little backdrop and the constant background music of the M6. There are a few nice features, however. 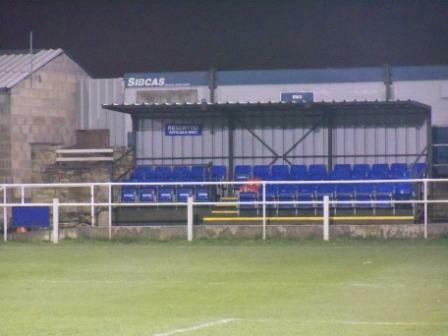 There is a nice looking small stone wall providing a tiny corner of terrace, next to a dropped-in-by-crane 60 seater blue seat stand. On the right as you come in to the ground an uneven corrugated roof gives protection to around 200 seats on three levels and continues, to provide some covered terracing at the end. These are the structures in the ground and they are all down the side you come in and get drinks. It was a good game with Bacup deservedly taking a 3-0 first half lead. Ashton were awarded a penalty early in the second half to give them hope. They got a second and pushed on for the equaliser, which didn’t materialise in the end. 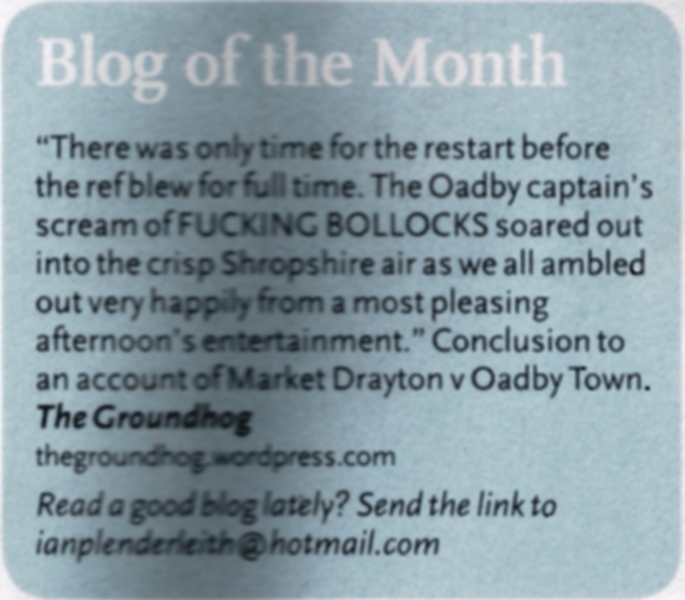 Coincidentally I bumped into another groundhopper here in the sparse crowd – Wil, a great bloke who writes the Sunday League Geek blog. He has a bigger camera than me (oo er) and takes a terrific photo – it’s well worth checking out his pics here http://sundayleaguegeek.blogspot.co.uk/. 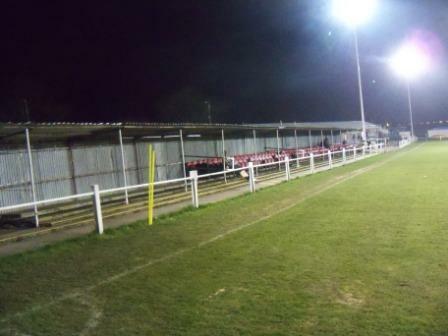 This entry was posted in Groundhopping, Non-League, Travelog and tagged Ashton Athletic, Bacup Borough, Brocstedes Park, Non-League, North West Counties League. Bookmark the permalink.